Resources For Staying On The Cutting edge! Completely revised and expanded, this CD Rom gives you the latest sources, know how and insight on using computers and obtaining online information. It contains an interactive computer disk you open in your web browser that gives you thousands of pages of free database searches you can run, aids you can obtain and the latest cutting edge information as it relates to investigation by computer. The exciting world of online information and other computer functions for private investigative practice is exploding and this manual gives you the sources and shows you the techniques in using your computer as a tool to obtain what you need to obtain with the flick of a few keys. 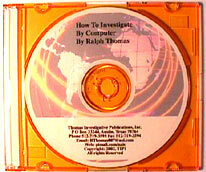 Just updated for 2000, this manual hands you both the sources, internet tools and search techniques to conduct your online searching on the included interactive disk. What once took you hours, days or weeks can now be done in a matter of minutes! This is your chance to get the most up to date sources and techniques, not only pertaining to online information but other investigative agency computer functions such as accident reconstruction, forensic photography processing, time management, marketing your services with your computer, report writing and much more. It's all here packed with hundreds of sources, brimming with hundreds of tips that will save you money and keep you on the cutting edge of investigative technology. Sample searches are given, as well as information on when to and when not to use online information sources. The interactive computer disk hands you thousands of pages of links. free searches, aids, cutting-edge computer technology and everything you need to investigate by computer. Don't let this information pass you by. Investigators who do not obtain basic online searching techniques and other computer skills will be left with nothing but domestic cases in the future. This extremely easy to follow manual takes you by the hand and shows you where to go, who to see, what to ask, what to buy and not to buy, and gives you sources for staying on top of the latest breakthrough technology so you will stay current and up to date.